Okay, this is definitely a bit spoiler-ish, so you’ve been warned. Read on if you don’t care, but just know this is a shot most likely occurring toward the end of the movie. Not worried? Wanna see it? Okay, here we go. It’s already been widely reported that Dane DeHaan plays Peter Parker’s good friend Harry Osborn in Marc Webb’s THE AMAZING SPIDER-MAN 2, which sees the return of Andrew Garfield, Emma Stone, and Sally Field, joined by villains Jamie Foxx as “Electro” and Paul Giamatti as “The Rhino.” Now if you know the comics (or saw the original Sam Raimi trilogy), you know that Harry Osborn eventually becomes The Green Goblin, a storyline that has already been revealed to play out in this new movie. Only this time, Harry’s dad Norman Osborn (played by Chris Cooper) skips the whole Goblin transformation (at least it appears that way) letting Harry become the glider-riding baddie Peter Parker must battle. There’s been glimpses of Harry as The Goblin in both poster and the trailers for the film, but we’ve yet to get a really solid look at him in that persona… until now. Check out this awesome image from the movie, which originates from FindAnyFilm and was then discovered by TotalFilm. 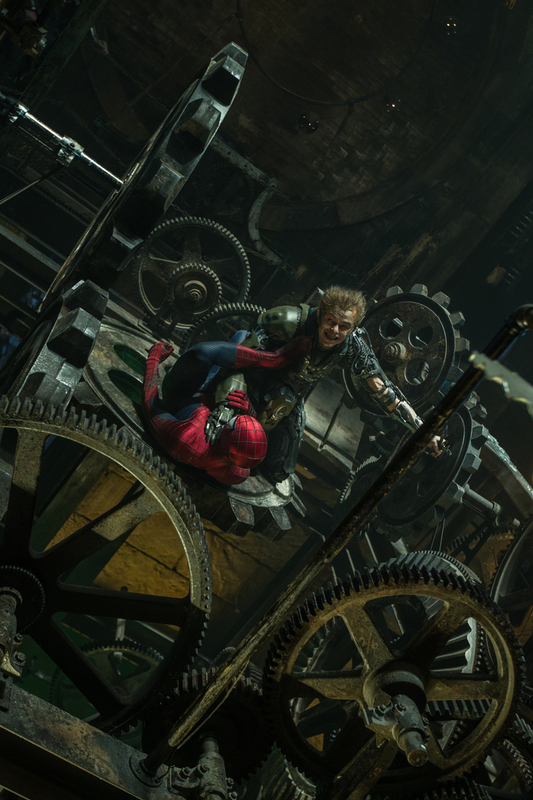 We’re going to go ahead and assume this is the big final fight of the movie, and as you can see Harry (or rather The Green Goblin) is getting the upper hand on Spidey – you can click on the image to see it a lot bigger. We’re also gonna guess somehow Peter Parker will win the battle, but until then check this out and tell us your thoughts in the comments. Are excited for the next big screen Spider-Man adventure?